Guest speaker Katelyn Pendleton and ECCAC CEO, Julie Hurst at recent Kieran May Memorial Gala. March 20, 2018…Raising over $230,000, the Emerald Coast Children’s Advocacy Center (ECCAC) put on their most successful annual Kieran May Memorial Gala & Golf event yet in early March. 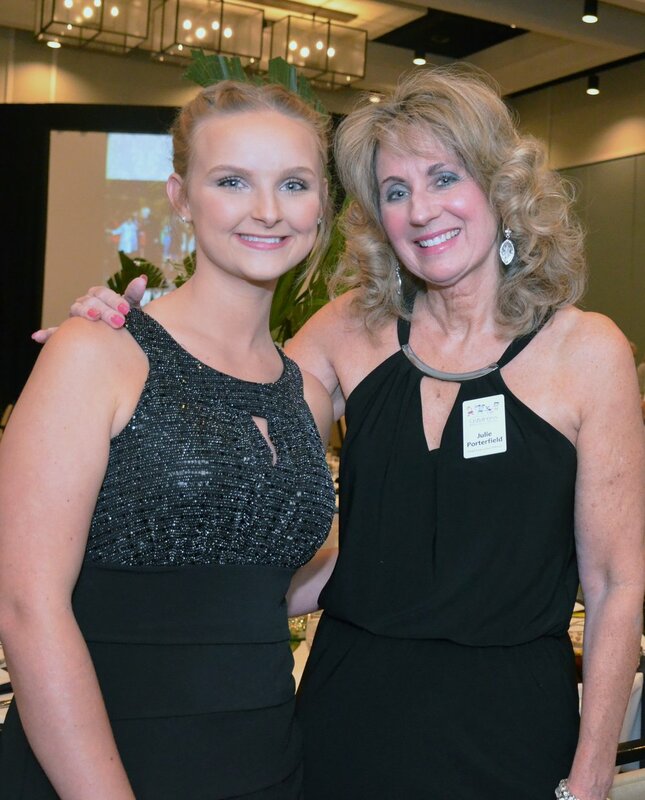 Guests were moved by a now grown up Katelyn Pendleton sharing her tragic childhood experiences and how ECCAC was instrumental in changing her life for the better. David Seering emceed the Gala, held at the Hilton Sandestin Beach Golf Resort & Spa, with an energetic live auction. With an impressive $100,000 raised from the live and silent auctions alone, paddles also went up in the air to help both centers in Okaloosa and Walton Counties. Mr. Big provided live entertainment throughout the evening. The Kieran May Memorial Golf Classic was held two days after the Gala at Kelly Plantation Golf Club with 116 golfers braving a rain laden day. Both events benefited children by raising funds to provide ECCAC services at no cost to help identify, treat and support children and their families in abusive situations. ECCAC wishes to thank their generous sponsors – Title Sponsors Jim and Tammy Pierce, Coastal Accounting, My Vacation Haven, Krueger, Fosdyck & Associates, Virtuous Management Group. Protector Sponsors: America ‘s Swimming Pool Co., Simple HR, Johnny on the Spot, The Donut Hole, Amy Rogers, Regal Stephens Builder-Developer, Hyatt Family, Publix Super Markets Charities. Friends of the Center sponsors: Acentria Insurance, CCB Community Bank, Conerly/Bowman/Dykes. Angel Sponsors: Kleinfeld Bridal, Hand Arendall Harrison Sale LLC, Trustmark Bank. For further information about the Emerald Coast Children’s Advocacy Center, or to make a donation, visit www.eccac.org or call 850-833-9237. If abuse is suspected, call the anonymous Florida Abuse Hotline at 1-800-96-ABUSE.